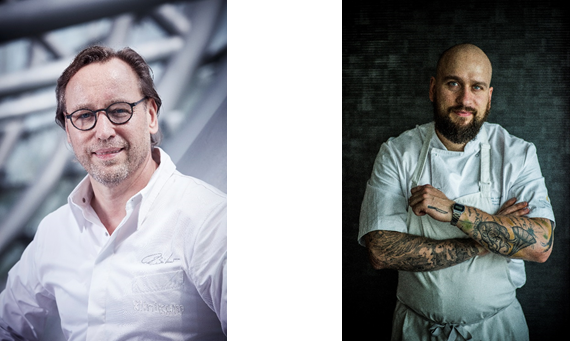 InterContinental London – The O2 is proud to announce an exciting collaboration between one of the world’s most revered chefs, Thomas Bühner who holds three Michelin stars at his restaurant ‘La Vie’, Germany, and Peninsula Restaurant’s incredibly talented Head Chef, Tomas Lidakevicius. Over the course of three days, 28th, 29th and 30th June Peninsula Restaurant will be home to a seven-course spectacular, with Thomas Bühner creating five of the courses and Tomas Lidakevicius creating two. Thomas Bühner is one of the today’s great culinary artists, sustaining three Michelin stars since 2012 at his famed restaurant, La Vie. He is also a member of Relais & Châteaux and Les Grandes Tables du Monde. Guests can expect beautifully crafted and unusual dishes such as Tomas’ ‘Pike Perch | Charcoal | Sea Vegetables | Lemon Verbena’ and Thomas’ ‘White Asparagus | Squid | Caviar Imperial | Carbonara Style’. Both chefs will bring their individual and celebrated styles to the meal, whilst ensuring both the chefs and their creations work in perfect harmony. “I am so looking forward to my time at Peninsula Restaurant. It is a marvellous space with jaw-dropping views of The Thames and Canary Wharf and I am of course excited to get into the kitchen with Tomas. He’s a real talent and one to keep a watch on.” Says Thomas Bühner. Tomas Lidakevicius, Head Chef at Peninsula Restaurant is creating some incredibly exciting and artful dishes. Working previously at Texture, Galvin at Windows and City Social, Tomas has a wealth of experience that he brings to every dish. His cookery style is modern, using unusual techniques and ingredients that surprise diners with every mouthful. “I’ve been an enormous fan of Thomas for many years, he really is a culinary icon. To have him in my kitchen is such an honour. Our cooking styles are very complementary, it’s worked out to be an incredibly exciting menu.” Says Tomas Lidakevicius. The collaboration menu is £80 for a four-course lunch with an added optional wine pairing. Dinner is seven courses at £145 with an added optional wine pairing. With Taittinger and Justerini & Brooks as two of the sponsors of the event, the wine pairing is set to be nothing short of exceptional.